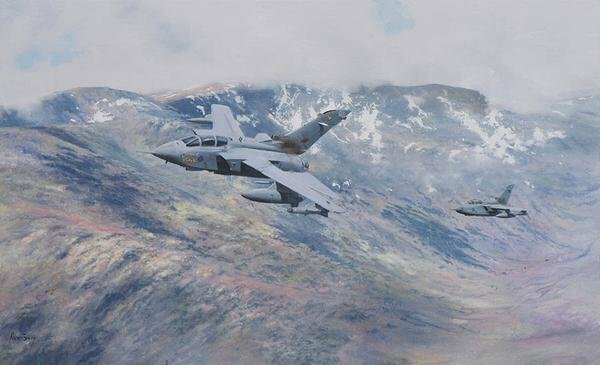 The Tornado painting represents a Panavia Tornado GR4 flying low over the Lake District during one of the RAFs training exercises. The type employs the variable geometry (swing wing) concept, allowing the aircraft to operate at its maximum flying efficiency during different flying conditions, i.e. landing, taking off, cruising and fighting. The mechanics hidden in the wings allows the under wing ordnance to be pointing fully forward irrespective of the angle of the wings, offering minimum airflow drag. A two seat fighter, the Tornado is an all weather day or night fighter capable of carrying all types of present day weaponry including DMS and Legacy Brimstone, Enhanced Paveway II, Storm Shadow, Paveway II, Paveway III, Paveway IV, Mauser 27mm Cannon, ASRAAM. The Tornado is the result of a multi-country consortium, built and operated by the component countries Britain, Italy and Germany. Saudi Arabia is also a purchaser of the Tornado. Capable of a maximum altitude of 50,000 ft and speed of Mach 1.3, the aircraft is powered by two RR RB 199 Mk 103 Turbofans, each with a thrust of 16,000 lbs. The 173rd Airborne Brigade has a long and distinguished history. The Brigade has answered America�s call to arms for 100 years from World War I to Vietnam and the Global War on Terror. The Brigade was constituted in 1917 as an Infantry Brigade and deployed to France in 1918 as part of the 87th Division. After returning to the United States, the Brigade was demobilized in 1919. In World War II the Brigade was re-designated as the 87th Reconnaissance Troop and it fought in three European campaigns. Although not part of the Brigade in World War II, the history of the 503rd Parachute Infantry Regiment is significant to the 173rd Airborne Brigade Combat Team. The 503rd PIR comprises half of the Brigade�s current fighting strength. The 503rd Parachute Infantry Regiment was formed in 1941 at Fort Bragg. The unit jumped into New Guinea in September 1943 as part of the first successful combat parachute assault in the Pacific Theater. On 16 February 1945, they jumped onto Corregidor Island where they earned the Presidential Unit Citation. The Brigade was reactivated in Okinawa in 1963 as the 173rd Airborne Brigade (Sep). The unit earned the nickname �Tien Bien� or �Sky Soldiers� from the Nationalist Chinese Paratroopers. In 1965, the Brigade became the first major unit of the United States Army to serve in Vietnam. They conducted the only combat parachute assault of the war in February 1967. During more than six years of continuous combat, the Brigade earned 14 campaign streamers and four unit citations. 13 Sky Soldiers who served in Vietnam received the Congressional Medal of Honor. The Brigade was deactivated in 1972. Reactivated in June 2000, the Brigade conducted numerous deployments across Europe. On 26 March 2003, the 173rd added to its distinguished history when nearly 1,000 Sky Soldiers parachuted into Iraq in support of Operation IRAQI FREEDOM I. During the operation, one Sky Soldier was awarded the Silver Star. In 2005, the Brigade deployed to Afghanistan along the contentious Pakistan border in support of Operation ENDURING FREEDOM VI. Five Sky Soldiers were awarded the Silver Star for gallantry in battle. Upon returning to Italy in 2006, the Brigade transformed into the 173rd Airborne Brigade Combat Team. In the spring of 2007, the 173rd ABCT executed an extended deployment to eastern Afghanistan in support of Operation ENDURING FREEDOM VIII where Paratroopers exhibited incredible bravery earning three Medals of Honor, one Distinguished Service Cross, and 32 Silver Stars. In 2009, the Brigade returned to Afghanistan for a third time in support of Operation ENDURING FREEDOM X, continuing its proud tradition of selfless service while securing and strengthening the Afghan government in Logar and Wardak provinces. In 2012, the Brigade again deployed to Afghanistan in support of Operation ENDURING FREEDOM XIII returning to Logar and Wardak Provinces where they executed the difficult task of transitioning security of the provinces to Afghan security forces. Upon returning to Italy in 2013, the Brigade was re-designated as the 173rd Infantry Brigade Combat Team (Airborne). Most recently, the Brigade has been called to support Operation ATLANTIC RESOLVE to deter Russian aggression, one of our Nation�s highest priorities. Today, Sky Soldiers continue the distinction of honored service dating back to World War I and proudly represent the Airborne fighting spirit wherever they serve.